Big rod-caught monkfish can weigh 27.2 Kg (60 lbs) or more. The average monkfish weighs around 9 Kg (20 lbs). The monkfish is easily identifiable; it has a huge head which is particularly broad, flat, and depressed, with the remaining body appearing tiny in comparison. Its wide mouth covers pretty much the entirety of its head and both jaws are equipped with long, sharp teeth. These teeth are sloped slightly inwards, meaning that once the jaws have closed it’s even harder for the prey to escape. The pectoral and pelvic fins are both extremely pronounced, allowing the monk fish to essentially walk along the bottom of the sea, where it hides amongst the sand and seaweed waiting for its unsuspecting prey. The monkfish has no scales, instead extending from its skin are structures which resemble small branches of seaweed. Warning: The monkfish has powerful jaws and sharp teeth, giving it the nickname of “Sea Devil”! Most whole fresh fish or large fish strips work well. Monkfish is best caught with larger baits as they have a huge appetite. The best types of fish to use as bait are mackerel, whiting, pollack, pouting, and herring. The monkfish is a summer visitor and can be commonly caught throughout May, June, July, August and September. Throughout the winter the monkfish departs to the ocean depths where it is very rarely caught by the average angler. The monkfish favours mud, sand, rocks and wrecks resting under deep water – around 40 fathoms (73.2 meters). Occasionally the monkfish does enter shallower waters inshore. Monkfish is found in most British waters, particularly the south coast and West Country. If you’re trying to catch monkfish from the shore, we advise casting from either a beach or rocks into deep water using a basic leger rig with a wire trace. If you’re boat fishing for monkfish, the most effective rig is a boat leger rig with a wire trace attaching hook to swivel on line. 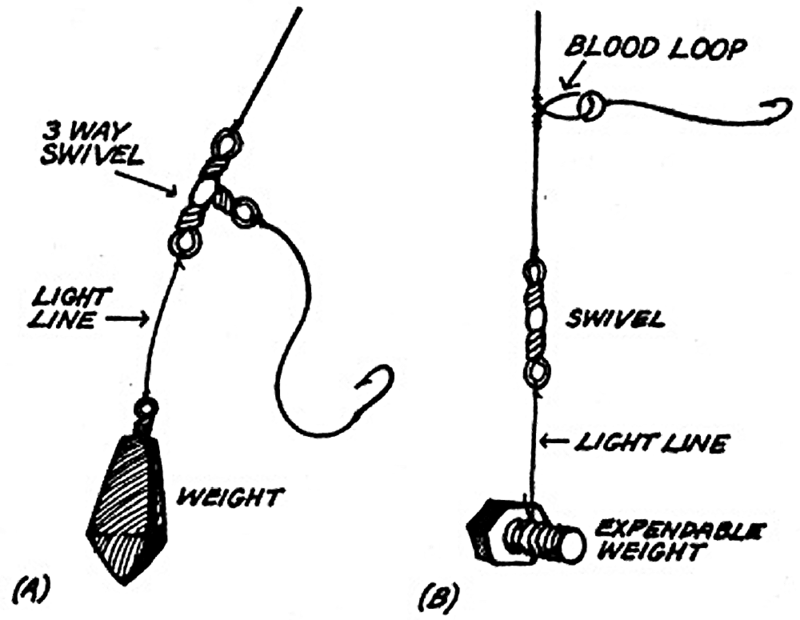 Alternatively you can use a simple paternoster rig where bait is presented slightly above snag-ridden stretch of seabed, with a wire trace attaching hook to swivel on line. Lastly you can also use a rotten bottom rig with a wire trace attaching hook to swivel on line. Be alert. Monkfish can remove bait from hooks with ease. Be aware for faint knocks or tugs and tighten your line immediately.